Have You Socialized with Earth Lately? I’ve been impressed with the rich blog entries that have led up to this one. My colleagues have offered some wonderful insights about how we relate to our work, our communities, our family, and ourselves. In overgeneralized terms, the entries touch on how we show up as social beings and maintain our authentic self. This entry adds another dimension. By intention, it’s a simple post meant to merely inspire a reunion to oneself through nature and invoke inquiry. This is the time of year when our neighbors are typically clamoring to get the last few leaves raked off their lawn—to give the lawn that one last cut so the grass is just the right height for winter’s passing. Fallen branches are picked up, bundled, and set by the curb to be taken away somewhere by someone. Sam and I looked across the street at my house and I smiled. The grass in my front yard has grown high by city standards, and the leaves lay organically over the ground in a collage of colors and shapes. Sam shook his head and appeared a bit put off by my “rebellious,” sustainable ways. I’ve always found it odd, really—odd the way people put so much effort into taming the lands, scheming nature, and destroying habitat. We cover Earth with concrete. We strategically harbor plants in boxed containers or designated areas. We manicure our monoculture lawns with gas run mowers, blowers, and edgers. We put up fences to claim our part of the Earth and control what gets in and out of “our” space. I envision a world where nature is no longer objectified or viewed as separate from us, but instead is included in the broader sense of self. If we are to instill life-centered or ecosystem-centered ethics in today’s society and in future generations, then our identity must be grounded in nature. After all, we are members of the ecological system. I began to wonder why people are so separate from nature? When was the last time you walked barefoot on the Earth? 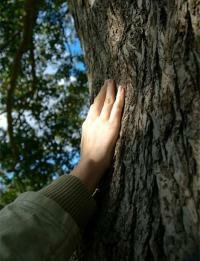 How much physical contact do you have with nature? Do you ever lie on the ground, or stop to touch the tree, or swim in a pond? Today, how are you going to recognize and connect to the very Earth that provides you life? What shifts in you if each day you make a conscious effort to reunite with nature?